This Steiff North American Exclusive stands almost 20 inches tall, is made of beige mohair and a LE of 750. In the late 1920's a young girl and her mother boarded a huge ocean liner from New York to Southampton for an Atlantic voyage. The little girl brought along her prized possession - a genuine Steiff Teddy Bear. In the hustle and bustle of life on board, the little girl and her teddy bear were accidentally separated. The little girl and her mother looked everywhere but her beloved bear was no where to be found. Just when they concluded that the bear was gone forever they were summoned to the "Lost and Found" office on the last day of the journey. There the little girl and her Steiff Teddy bear were joyfully reunited. 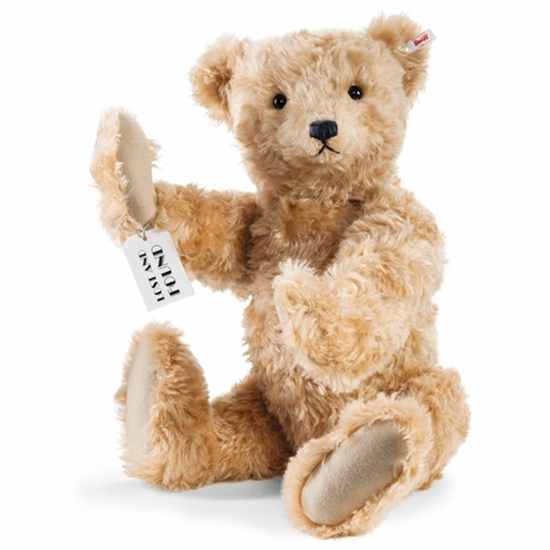 New in 2015 Steiff brings this heartwarming true story to life with the Lost and Found Bear. Made of the finest beige mohair, he is 5-way jointed, stands almost 20 inches tall and is a North American Exclusive with a small edition size of 750.